A Whiter Shade of Pale, based on a Bach cantata, was released in the summer of 1967 to meet with spectacular British and American success. This mysterious, haunting song, now acknowledged as a pop classic, heralded the arrival of Procol Harum into the music business. In many ways it was an overnight success for they were by no means a long-established group. In 1966 Gary Brooker had teamed up with lyricist Keith Reid and together they produced some adventurous material. 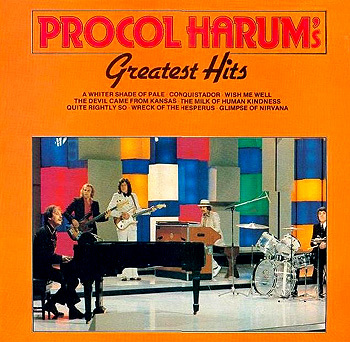 Procol Harum was assembled to perform the Brooker-Reid compositions; their debut single was A Whiter Shade of Pale; the record soared up the UK charts to the No. 1 position; Procol Harum had made it. It was as simple as that! They may have been an overnight success but the group went on to prove that they were no flash in the pan. Whilst they have never managed to repeat the devastating success of A Whiter Shade of Pale, Procol Harum have produced high quality music ever since and have an extremely strong following. Much of the credit for this must surely be due to the Brooker-Reid partnership. For various reasons, the group has seen a continual influx of talented new musicians over the years which, far from detracting from it, has served to keep Procol fresh and inventive. The solid framework of Brooker's superb piano work and compositions, together with Reid's scholarly lyrics, has ensured the necessary stability. This superb collection includes many of Procol Harum's best songs and includes Conquistador and, of course, A Whiter Shade of Pale. It is a must for all devotees of good music."